Kyle Edmund and Liam Broady will enjoy one of the first perks of their rise into the world's top 200 this week, as they make their debuts in the qualifying event for the first Grand Slam of the year. Three rounds of qualifying for the Australian Open begin in Melbourne on Wednesday. Edmund - who celebrated his 20th birthday last Thursday - has risen nearly 200 places to 192 in the world, while Broady - who has turned 21 since the start of the year - is just one place further back after jumping nearly 300 spots in the past 12 months. 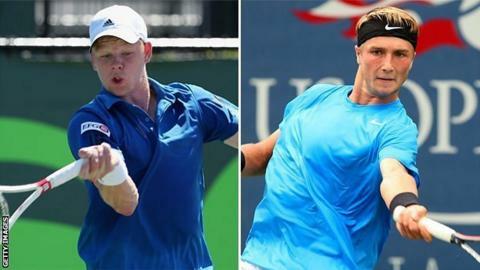 "My aim at the start of last year was to finish with a 'one' next to my name," Edmund told BBC Sport. "And I did it in the last tournament. I think it is a nice platform: I ended the year on a high." As did Broady, who reached his first Challenger final in Tennessee in November, having become a serial winner on the Futures Circuit, which is one rung below. "At the start of the year my aim was to finish at 250 and it seemed like quite a distant target," he said. "I'd hardly played a Challenger." Edmund is now working full-time with the LTA's head coach James Trotman, having realised late last year that his then coach Greg Rusedski's family and broadcasting commitments would never afford him enough time on tour. The two remain in contact, and indeed it was a pep talk from Rusedski which precipitated a parting of the ways. "One of the first things he Greg said to me was: 'You've got to be selfish, and you've got to do what's right for you,'" said Edmund. "Making a decision with Greg was a tough decision - when you're making a change in your set-up, it's not something you just think about in two minutes, it's a process you go through. You weigh up options and have to get the best for yourself." Andy Murray was impressed by how hard Edmund worked when he joined him for pre-season training in Miami at the end of 2013. The 20 year old spent another week in Florida last month to prepare for the new year and his opportunity to qualify for his first overseas, senior Grand Slam. Edmund says it is a "nice feeling" to know he has made the qualifying draw by right. He claims not to have a ranking target for the year ahead, but is very frank about how he wants his style of play to evolve. "I have an aggressive game style - I like to use my serve and my forehand as a weapon," he said. "I'd like to come forward a bit more: sometimes I use my forehand well, but then don't take advantage of that as well as I could. "It's obviously easier said than done. In certain situations, you're a bit hesitant to come forward because these days the guys move so well, and if they get a racquet on the ball they have half a chance of passing you." Broady is more precise about where he would like to find himself 12 months from now. "Ideally I'd like to be in the top 100 by the end of this year," he told me. "That's obviously a fantastic target to have but I believe I can do it. I need to work very hard - harder than most - and work in the right way. "My whole game has come on, just by playing with better players in the Challengers and getting used to the speed of the ball." Broady created big expectations for himself by reaching the final of both Wimbledon and the US Open as a junior. His progress over the past year has been very encouraging, even if the prize money he has earned has not made it any easier to make ends meet, given the extra distances you need to travel between events on the Challenger Tour. Both men know they could be duelling for a potential third singles spot in the GB Davis Cup team for the first-round tie with the United States in Glasgow in March. "I think we spur each other on," Broady told me in conclusion, "and I think it will be a good rivalry that will push us to go higher and higher."